There were 30,715 fans in the Carrier Dome in Syracuse on Saturday to watch the Crunch beat the Utica Comets 2-1 in an AHL game. That is the largest crowd ever to watch an indoor hockey game in North America. 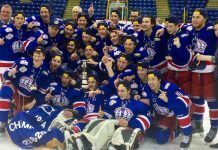 The previous record of 28,138 was set in 1996 when the Philadelphia Flyers played the Tampa Bay Lightning in the ThunderDome in St.
Petersburg, Fla. . . . Former Portland Winterhawks assistant GM/assistant coach Travis Green is the Comets’ head coach. They are the AHL affiliate of the NHL’s Vancouver Canucks. . . . The Comets are 12-4-2 and hold a three-point lead over the Adirondack Flames atop the North Division. 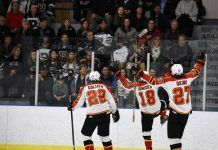 The Adirondack Flames beat the Rochester Americans 2-1 on Saturday night. The Flames, the Calgary Flames’ AHL affiliate, now have won eight straight games. 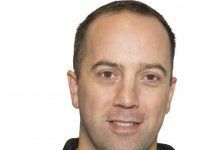 Former Kelowna Rockets head coach Ryan Huska is in his first season running Adirondack’s bench. Adirondack is 11-6-1. In Saskatoon, F Coda Gordon scored at 2:56 of OT to give the Swift Current Broncos an 8-7 victory over the Blades. . . . With 15 goals, it obviously was something of a bizarre evening. It also was Pucks ‘N Paws Night, so there were lots of dogs in the house, and the game included about a 20-minute delay in the third period because of a hole in the ice. . . . Saskatoon F Nikita Soshnin had forced OT with his first WHL goal at 18:04 of the third period. . . . The Broncos led this one 3-0 in the first period, only to have the Blades scored the next three goals. . . . Swift Current went on to lead 5-3, 5-4, 6-4 and 6-5. . . . Saskatoon F Austin Adamson tied it at 13:19 of the third, with Broncos F Andreas Schumacher giving his guys a 7-6 lead at 16:51. . . . Schumacher finished with two goals, giving him five, and added two assists. . . . Broncos D Brent Lernout recorded his first WHL three-goal game. Lernout, a third-round pick by the Montreal Canadiens in the NHL’s 2014 draft, went into last night with three goals in 26 games. . . . Lernout played the first 20 games of his WHL career with the Blades. He went into last night with 12 goals in his previous 139 regular-season games with the Broncos. . . . According to the Broncos, Eric Doyle was the last Swift Current defenceman to score three times in one game. He did it Nov. 18, 2007, against the Blades. . . . Broncos F Glenn Gawdin scored his eighth goal and added three assists, while D Dillon Heatherington also had three assists. . . . 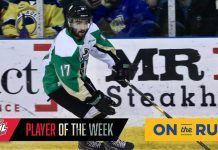 The Blades got two goals from F Josh Uhrich, who has four, and three assists from each of D Amil Krupic and F Nick Zajac. . . . Gawdin has 22 points in 27 games this season, after finishing last season with 22 points in 66 games. . . . Saskatoon G Nik Amundrud, who had missed seven games with an undisclosed injury, stopped two of five shots and left at 10:38 of the first period. . . . Saskatoon D Ryan Coghlan returned after missing 11 games with a shoulder injury. . . . The Broncos are 14-9-4. . . . The Blades (6-16-1) have lost four straight. . . . In Brandon, F Tim McGauley scored at 1:46 of OT to give the Wheat Kings a 5-4 victory over the Edmonton Oil Kings. . . . One night earlier, the Wheat Kings (19-5-1) beat the Oil Kings, 7-4. . . . McGauley finished with two goals, giving him 11, and an assist. HE also had three points in Friday‘s victory. . . . Brandon overcame a 4-2 third-period deficit when F Jesse Gabrielle scored at 1:36 and F Jayce Hawryluk tied it at 15:18. . . . Gabrielle and Hawryluk each has 13 goals. . . . Brandon F Nolan Patrick, who had two goals on Friday, added a goal, his seventh, and an assist in this one. . . . F Lane Bauer had two goals, giving him eight, and an assist for the Oil Kings (12-10-3). . . . Edmonton F Brett Pollock ran his point streak to seven games with one assist. . . . This was the third time in four games that the Oil Kings went to OT. They went 1-0-2 in those games. . . . Edmonton F Cole Benson scored his fifth goal of the season. He has 14 points in 25 games. Last season, he finished with 13 points in 59 games. . . . Rob Henderson of the Brandon Sun has a game story right here. . . . In Lethbridge, G Justin Paulic stopped 26 shots to help the Moose Jaw Warriors to a 5-1 victory over the Hurricanes. . . . The Warriors (10-11-3) are 1-1-1 in their last three outings. . . . The Hurricanes (5-14-4) have lost eight in a row (0-5-3). . . . Moose Jaw G Zach Sawchenko wasn’t dressed for the Warriors. He turned from an injury-forced absence on Friday night but left after one period having apparently re-injured himself. . . . F Tanner Jeannot, F Kolten Olynek and F Brayden Point each had two assists for the Warriors, who broke open a scoreless game with three goals in 5:55 in the second period. . . . F Jaimen Yakubowski, who like Olynek once played for the Hurricanes, got the game’s first goal, his fourth. . . . Warriors F Tanner Eberle scored his 12th goal, while D Austin Adam got his first. . . . F Carter Folk was among Lethbridge’s scratches. He has been suspended under supplemental discipline for something that happened during Friday’s game in Cranbrook. . . . 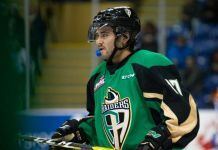 The Hurricanes entertain the Prince Albert Raiders late this afternoon. . . . The Warriors are in Cranbrook tonight to meet the Kootenay Ice. . . . In Red Deer, G Rylan Toth posted his first WHL shutout as the Rebels beat the Calgary Hitmen, 4-0. . . . Toth, an 18-year-old from Saskatoon, finished with 23 saves. . . . Red Deer F Scott Feser scored his eighth goal and added three assists. . . . F Wyatt Johnson helped out with his 12th goal and F Evan Polei notched his 11th. . . . The Rebels broke a scoreless tie with three goals in 7:12 in the second half of the second period. . . . Red Deer (13-9-3) had won two straight. . . . The Hitmen (12-9-3) were 5-0-2 in their previous seven games. . . . The same two teams meet this evening in Calgary. . . . In Medicine Hat, G Wyatt Hoflin turned aside 48 shots as the Kootenay Ice beat the Tigers, 3-0. . . . Hoflin has one shutout this season and two in his career. . . . As WHL Facts pointed out on Twitter, that is the most saves by a goaltender in a shutout this season. . . . The Tigers held a 20-10 edge in shots in the first period and 21-6 in the third. . . . Ice F Jaedon Descheneau scored the game’s first goal, on a PP, at 13:49 of the first period. . . . He’s got 12 goals. . . . Ice F Sam Reinhart drew an assist on that goal to run his point streak to seven games. . . . The Ice (10-14-0) has won two in a row, while the Tigers (16-6-2) have dropped two straight. . . . The Ice is at home to the Moose Jaw Warriors tonight. . . . In Vancouver, F Zach Pochiro broke a 3-3 tie at 18:48 of the third period to give the Prince George Cougars a 4-3 victory over the Giants. . . . Pochiro scored his first two goals of the season in this one. . . . According to a story on the Cougars’ website, written by radio voice Dan O’Connor, the winner came after “a Giants clearing attempt took a weird bounce off of an official and bounced out in front of the Giants goal. The first player to arrive at the loose puck was Zach Pochiro who snuck a shot past (G Cody) Porter.” . . . The Cougars held 2-0 and 3-1 leads before the Giants tied it on third-period goals by F Carter Popoff, his 13th, at 3:48, and F Matt Bellerive, his second of the game and ninth of the season, at 15:34. . . . Cougars F Aaron Macklin and Vancouver F Dakota Odgers were ejected after fighting 12 seconds into the first period. . . . Prince George G Tavin Grant, who is from Burnaby and had family in the crowd, stopped 19 shots for his second WHL victory. . . . 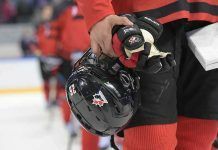 The Cougars were without F Chase Witala, who suffered a leg injury on a knee-on-knee hit by Kamloops Blazers F Matthew Campese on Friday night. Campese was hit with one of those ‘tbd’ suspensions on Saturday. . . . The Cougars are 13-13-0, while the Giants, who have lost three in a row, are 9-15-0. . . . Steve Ewen of the Vancouver Province wonders right here just where the Giants’ season is headed. In Victoria, G Jayden Sittler stopped 33 shots as the Royals blanked the Regina Pats, 5-0. . . . Sittler has two straight victories and his first career shutout. . . . D Travis Brown scored twice for the Royals, giving him nine goals. . . . Brown got the game’s first goal, via the PP, at 9:08 of the first period. . . . The Pats are 1-1-0 on their B.C. Division trek. . . . Regina (13-10-1) had won its previous five games. . . . 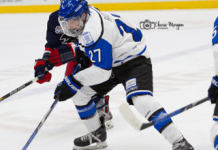 The Royals (14-11-2) have won two straight. . . . G Jordan Hollett, a first-round selection in the 2014 bantam draft, made his WHL debut for Regina with 21 saves. 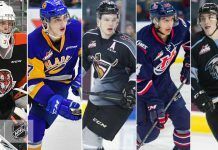 Hollett, 15, is from Langley, B.C. . . . Victoria F Austin Carroll scored his 17th goal. . . . In Kent, Wash., D Carter Cochrane scored the only goal of a five-round shootout as the Everett Silvertips got past the host Seattle Thunderbirds, 3-2. . . . Cochrane, who is pointless in 12 games this season, also scored a shootout goal during a 15-round victory over the Kamloops Blazers last weekend. . . . Everett F Graham Millar forced OT with a PP goal at 17:20 of the third period. He has eight goals. . . . F Patrick Bajkov of Everett scored the game’s first goal at 14:02 of the first period. . . . Seattle F Keegan Kolesar tied it on a PP at 6:12 of the second. He’s got seven goals in 23 games this season, after scoring two in 60 games last season. . . . Seattle F Justin Hickman gave his side a 2-1 lead with his seventh goal 17 seconds into the third. . . . Everett G Austin Lotz stopped 31 shots through OT. . . . Seattle G Taran Kozun made 29 saves. . . . The Silvertips (15-4-3) snapped a two-game losing skid. . . . The Thunderbirds (9-11-4) have lost four in a row. . . . “I just think we’ve forgotten how to win,” Seattle head coach Steve Konowalchuk told reporters after the game. . . . Everett and Seattle each has gone to OT eight times already this season. . . . The game was delayed for about 10 minutes in the second period after Everett D Nikita Scherbak went down after a hit from Kolesar. No penalty was issued on the play. Scherback was placed in a neck brace and removed from the ice on a stretcher. Late last night, the Silvertips tweeted that Scherbak has “movement in all his extremities and his head/neck are okay. Undergoing tests for a potential back injury.” . . . Prior to the game, the Silvertips contributed $250 to the WHL’s Christmas shopping fund, the result of a warmup violation in Victoria on Friday night. . . . The Thunderbirds honoured the 1981-82 Seattle Breakers prior to the game, including head coach Jack Sangster and former player Mitch Wilson. The latter is battling ALS and there is a GoFundMe page working on his behalf. That page is right here. . . . In Kelowna, the Portland Winterhawks scored the game’s first three goals and went on to a 4-3 victory over the Rockets. . . . The Winterhawks, who beat Kelowna 4-3 in OT on Friday, won three of four games with the Rockets this season. They won’t meet again unless it’s in the playoffs. . . . F Rourke Chartier scored twice for Kelowna, upping his WHL-leading total to 26. His first goal, shorthanded at 13:00 of the third, cut Portland’s lead to 3-2. . . . Portland F Miles Koules got his eighth, on a PP, just 37 seconds later. . . . Chartier got his second goal at 19:25. . . . Chartier also had an assist, while F Nick Merkley drew two assists. . . . Chartier and Merkley are tied for the WHL scoring lead, each with 45 points. . . . F Chase De Leo got his 15th goal for Portland and F Oliver Bjorkstrand scored his 13th. . . . Winterhawks G Aden Hill stopped 34 shots, six more than Kelowna’s Jackson Whistle. . . . The Winterhawks (11-12-3) have won two in a row. . . . The Rockets (21-2-3) were 11-0-3 in their last 14 outings. . . . Kelowna, with seven players injured, was playing its fourth game in five nights. . . . F Paul Bittner was among Portland’s scratches after he suffered a leg injury in the second period of Friday’s game. . . . In Kennewick, Wash., F Calder Brooks broke a 1-1 tie at 2:31 of the second period and the Spokane Chiefs went on to beat the Tri-City Americans, 2-1. . . . F Beau McCue gave the Americans a 1-0 lead at 3:09 of the first period on a PP. He’s got 10 goals. . . . Spokane F Riley Whittingham tied it with his fifth goal at 2:22 of the second. . . . Brooks got his eighth just nine seconds later. . . . The Chiefs held a 57-39 edge in shots. Spokane G Garret Hughson stopped 38 shots, while Tri-City’s Eric Comrie turned aside 55. . . . The Chiefs (11-7-3) have won two in a row. They are at home to the Kamloops Blazers tonight. . . . The Americans (14-10-0) had won their previous two. They also had won four in a row at home.